I buy chromed grill frame from ebay, but it is wrong model to my -37 170V. I have to repair original. Question two: Grill. Painted or chromed ? Some color found in top part of grill. Looks light grey. Is it original??? the radiator mask is chrome plated. Attached a useful link on Mercedes color codes. Thank you Ulli, for help. Does anyone know answer for question one??? 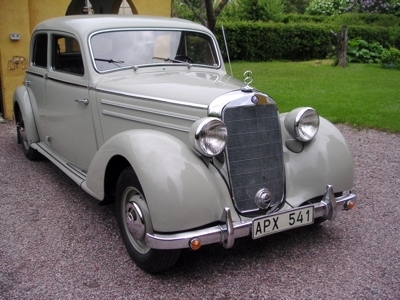 Hello Paavo, the colour of the radiator grille was discussed before in this forum. I am not sure if any real consensus was established, but the most probable colour seemed to be RAL 7033 Zementgrau (Concrete gray). As to your other question, the radiator frame looks like a 170 S, but I am far from my own car at the moment so I cannot compare the measures. Maybe someone else can help you. I‘ll ask my Lacker for the RAL Code. It can take some day‘s. Thank you Jan. My grill original color looks light grey with little amount of green. But I am happy if my grill looks same as 80% of similar cars. RAL 7003 should be the correct color code. Please find attached a link from the MVC Depesche which confirms this. I still waiting to confirmation to my question one. I try RAL7033 paint in my grill. Looks like perfect color (81 years old paint vs. new in picture) Thank you jimattson.